A simple recipe for blackened halibut. 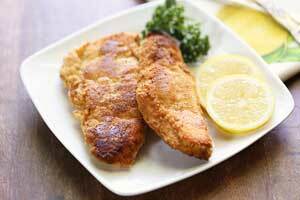 The fish comes out juicy and very flavorful, crispy on the outside and tender on the inside. This blackened halibut is wonderful. Halibut is a mild-tasting fish. But blackening turns it into an intensely flavorful dish that my entire family enjoys. What is the blackening cooking technique? When blackening food, the food is dipped in melted butter and then dredged in a mixture of herbs and spices. It is then cooked in a very hot cast-iron skillet. This creates e characteristic brown-black crust on the food, the result of browned milk solids from the butter and charred spices. So the blackened halibut becomes crispy and blackened when the seasonings used to coat it become charred in a hot skillet. Blackening is a very tasty way of preparing fish. The inside is tender and flaky while the outside is crusty and boldly seasoned. Blackened salmon is excellent too. There seems to be a link between the frequent eating of large amounts of charred food and cancer, although the actual non-laboratory risk is probably very small. Still, I wouldn’t eat blackened halibut every day. The decision is yours, of course, but like everything else, moderation is a good idea. My personal choice is to make blackened halibut for my family about once a month. What to serve with blackened halibut? I like to serve it with cauliflower fritters, with okra stew, or with roasted vegetables. When I’m especially lazy, I serve it with creamy cucumber salad. What to do with leftover blackened halibut? If you have leftovers, you can keep them in the fridge, in an airtight container, for up to 3 days. Make sure you reheat them very gently though, so as not to dry out the fish. Reheat them covered in the microwave, on 50% power. 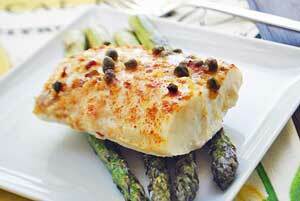 Another good halibut recipe is this recipe for grilled halibut. It’s excellent, and my husband and I really enjoy it. But my kids do prefer blackened halibut. And keto fried fish is amazing. You get to eat fish ‘n’ chips (well, at least the “fish” part), but it’s healthy! In a shallow dish, whisk together the paprika, thyme, oregano, onion powder, garlic powder, kosher salt and cayenne. Sprinkle the halibut fillets with the seasoning mixture, pressing with your fingers to help the coating adhere. Heat a large nonstick skillet over medium-high heat, 2-3 minutes. Traditionally you would use a cast iron skillet, but I use a nonstick hard anodized aluminum skillet to minimize the risk of sticking. Add the butter to the hot skillet and swirl to coat. Add the halibut fillets. Cook 4 minutes on each side, until the fillets turn from translucent into opaque and white (it’s fine to cut a small slit and peek). Spoon the pan juices on top of the fish, and serve.